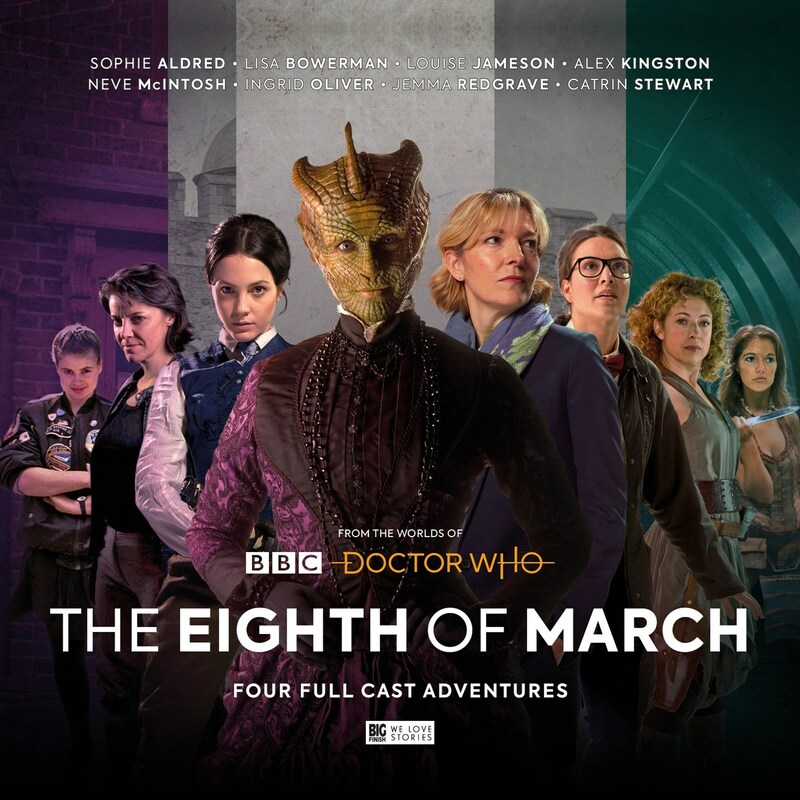 To celebrate International Woman’s Day and remove any excuse to not remember the date, Big Finish celebrate the women of the Whoniverse from both old and new versions of the show. Each story taking place on 8th March. River Song (Alex Kingston) attends the Galactic Heritage Convention as the Timelord’s delegate. Leela (Louise Jameson) attends to find out who is claiming to be the Timelord’s delegate when they didn’t send one. But both get soon caught up in a royal kidnapping and a conspiracy to keep a people enslaved. There is a lot to say about this story, but I know the first thing I’d want to know reading a review of it and yes! This pairing is just as good as you’d imagine it would be. Kingston and Jameson shine in a greatly crafted script by McMullin. Leela is as feisty as ever but is forced to be the responsible one (surely helped by her time on Gallifrey) when River acts wildly and impulsively, as she has want to do. They are given a great guest cast to bounce off and given some really interesting moral quandaries and difficult problems to solve. Ace (Sophie Aldred) and Benny (Lisa Bowerman) find themselves left at a loose end when the Doctor (Sylvester McCoy) leaves them in a contemporary Liverpool university whilst he goes off on other business. When people go missing and Benny joins their number Ace is left to investigate. Things go from bad to worse for her when the Tardis is replaced by a big blue book. And that’s just the half of her problems. I like whenever we dive into this less ‘explorer’ era of Ace and Benny in the 7th Doctor era. The way it’s written feels organic that the Doctor is pre occupied and they happen to be in the right place for an adventure (unless the 7th Doctor is manipulating events again?). The main idea of people going missing and how they go missing (spoilers sweetie) is really original and interesting, as is the villain of the week. Sophie Aldred carries the lions share of this story and I think, although she is always great, this is a real showcase of her sans Doctor. Where Bowerman comes into the story she is just as wonderful and we are all used to her carrying her own adventures. They also in this story give propers to the First lady within the Doctor Who world; one we too easily overlook, but gets the Doctor where he is going every time. The Paternoster gang, ahead of their first Big Finish boxset, investigate a series of break-ins. Whilst Strax (Dan Starkey) wants to solve things in a Warriors fashion, Vastra (Neve McIntosh) and Jenny (Catrin Stewart) decide to Investigate. Said investigations lead them to the house of an unpleasant to deal with scientist and his down trodden assistant where things take on a more sinister turn. Langford has done a really good job in this script to include and use Strax well but have him being a secondary character to the female stars. In this story we get to see the love between Vastra and Jenny, their frustrations in the time in which they live and their sense of hope. There are some really nice twists and this is greatly timed to get us excited for their upcoming full set. I get a feeling this will take up the sad void of Jago and Litefoot. The two Osgood’s (Ingrid Oliver) investigate a dating website, Narcissus, under the watch of Kate Stewart (Jemma Redgrave) when a member of UNIT goes missing on a night out. When one of the Osgood’s goes undercover in another persons face they end up causing more confusion and opening up a bigger mystery than they bargained for. As Narcissus is only looking for the most beautiful people, the Osgood’s begin to realise beauty is more than skin deep. It’s really nice to visit the two Osgood’s period of new UNIT; which till now has been explored in the pre “Day of the Doctor” period only. Ingrid Oliver gives a tour-de-force performance; showing the good, bad and confusion of having two versions of yourself wondering around and even the jealously that would cause. Where apps for dating are so rife and so easy to be used for nefarious purposes this is great fodder for a well told UNIT tale.